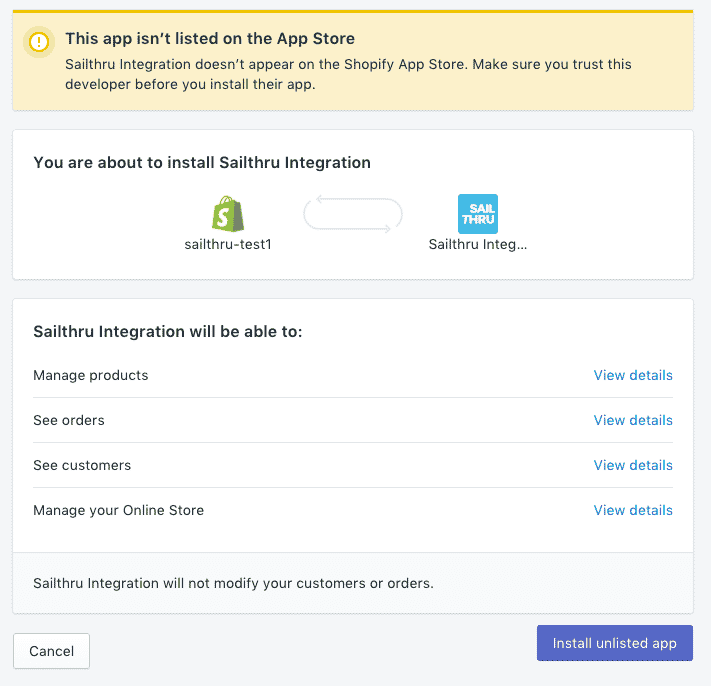 Sailthru’s Shopify app allows you to quickly integrate Sailthru into your Shopify store workflow. Sync purchase data with Sailthru. Gather your customers’ product page views, and user interest data using Horizon. Update all of your product information directly into your Sailthru Content library. Add users to Sailthru that make a purchase. Sailthru offers a robust set of user and list management features via the Sailthru UI and API. The Shopify app does not directly support user management, such as lists, segments, user variables outside of the purchase data. Users who complete purchases will be added to the Sailthru system. Install the app by visiting this url You will be asked to provide your Shopify Store URL and you may need to log in to your Shopify account. Once logged in, confirm that you want to install the app. Recent changes to Shopify’s App Store will show the app as an unlisted app, this is expected. Add your Customer Id, also available in My Sailthru->Settings->Setup->API & Postbacks. Sailthru enables you to send abandoned cart reminder emails from Lifecycle Optimizer or by triggering a send directly from Shopify. We recommend using Lifecycle Optimizer for more flexible customer journeys. This method requires the latest Sailthru Script Tag to be enabled in the Shopify app or deployed using a third party tag manager. If you want to use this method then you will need to leave the Abandoned Cart Template and Abandoned Cart Email Send Delay empty. See image below for an example. For customers who are still using Horizon JS, In order to send your customers an abandoned-cart reminder email, we can set a reminder time and a choose a template to send. First, you will need to have an abandoned-cart email template configured and listed in My Sailthru on the Templates page. You can use this guide to help you set up an email template, and this guide for creating your abandoned cart email. Once you have an abandoned-cart template ready in Sailthru, you can open the Shopify app settings page and choose the Abandoned Cart template from the drop-down list. Enter the time (in minutes) that the app should wait before sending the customer an email reminder about their abandoned cart. For example, “120 minutes”. Once installed and configured, the Shopify app will pass all purchase data to Sailthru as it happens. In order to import your historical purchase data, consult your Sailthru Project Manager or Customer Success Manager. They can advise you on the proper route for importing this data, typically using the Sailthru Job API. Tags on your content items are required for Sailthru’s Personalization Engine to be able to measure individual user interests. The Shopify app will use your existing Shopify tags to build interest profiles for each user. Tags are managed within Shopify on each product using the Shopify admin. To manage tags for a specific product you can browse to the product page and adjust the “Tags” field. When the product is saved the Content API call is saved and the tags that were applied to the product in Shopify will be visible in your Content Library in Sailthru for that product and used as interest tags. For more information about how interest tags are used see our documentation on Content in Sailthru. Tags are used for personalization , but can also be used to create/filter a feed for email campaigns and Site Personalization Manager. Please note that tags will be automatically converted to dashed-lowercase-format for consistency. For example the tag “Vintage Tee Shirt” in Shopify would be converted to “vintage-tee-shirt” in Sailthru so if you are creating feeds or using Zephyr in Sailthru with tags remember to use the Sailthru tags from the Content Library and not your Shopify tags to filter content. Shopify Plus customers can request from their Shopify Account Manager that the following transactional emails are disabled in their Shopify account. To access these settings choose “More->Notifications” from the app navbar in the Sailthru Shopify app. This will present you with an editing screen for each template, the notification will use the Sailthru Send API. Please make sure to work with your Shopify Plus account manager to turn off any emails enabled here or customers will receive duplicate emails.